On February 6, 2008, oil prices (WTI) dropped to $87.16, the lowest price since the prior October. Oil had been rising as the market misunderstood and dramatically mispriced what was going on; buying on the idea of monetary policy accommodation in growing intensity, while at the same time not factoring the hidden monetary destruction that was far greater. It was in many ways an extension of then-Fed Chair Ben Bernanke’s March 2007 Congressional testimony that, “problems in the subprime market seems likely to be contained.” Whatever was happening in global finance, the illiquidity was expected both to stick to MBS and mortgages exclusively while being overcome by the “Greenspan put” of greater monetary effort under Bernanke. From that point on, the dollar was replaced by the “dollar” as what was before hidden and thus totally discounted could no longer be so overlooked; monetary destruction was very real and happening very quickly no matter what the Fed or any other central bank proposed, talked about, or actually did. By the time the SEC’s short sale ban actually took effect, just a week later, WTI was already under $125. When the GSE’s finally failed, technically placed by FHFA into conservatorship, oil prices were back near $100. Despite a ridiculous 1-week surge after Lehman failed, likely predicated on what was happening elsewhere with AIG, Wachovia, etc., WTI was under $80 during the full panic. As we review these recurring patterns it is clear that humanity is intruding, that funding, as anything else, is not purely mechanical or robotic and displays pieces of emotional outbreak. That was the case in 2011 as the spring surge/summer purge was again on full display. That year began under the auspices of QE2, where once again the “market” had ignored the fact that a second dose of QE actually disqualified the “Q” part, leaving questions about the “E” lingering in the growing concern over Europe. But it was not strictly European business that was amiss; it was, in fact, “dollar” business yet again. 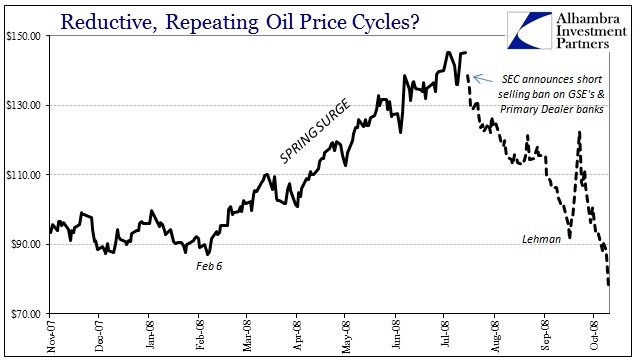 Despite that funding reality, oil prices all over again surged in the spring, starting at almost exactly the same place on the calendar as 2008 (or 2016 and 2015, for that matter), February 15. WTI and Brent took negative T-bill rates in stride, as oil rebounded to $113 by late April. 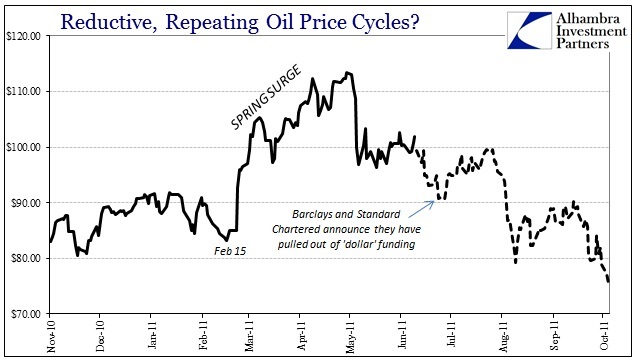 European shocks sent prices lower in May and then further “dollar” irregularities from then on. On June 18, 2011, the Telegraph reported serious “dollar” problems indicative of just how the “dollar” deserves the quotation marks I use around the term. While the paper describes it in terms of “tens of billions of pounds” it was really “dollars.” That meant big banks in the United Kingdom were withdrawing “dollar” funding in unsecured markets from European banks, none of which had much connection at all to the United States or its constitutional duty to the dollar (no quotes). QE2 and the supposedly enormous expansion of the Federal Reserve balance sheet wasn’t even a thought. On September 14, the ECB announced three dollar auctions conducted in coordination with the Fed, BoE, BoJ, and SNB. Between the Telegraph story in mid-June and the ECB announcement in mid-September, global stocks plunged, bank rumors swirled, the SNB pegged the franc to the euro, and oil prices dropped back under $80. This year, 2011, has seen this lack of interbank currency progress far further than anyone imagined possible. Those past European guarantees are a distant memory, as interbank lending has essentially broken down completely – again. This has created a crazy dance of accounting tricks to guarantee debt without really guaranteeing debt. The EFSF was supposed to be the successful end of the crisis, as it would take a pool of “money” from various European countries and leverage it into a kind of old-school CDO. But there is something discomfiting about a guarantee where the guarantors are very much unwilling to directly participate in it, and where a sizable portion of those guarantees come directly from those needing the bailout in the first place. As the EFSF finally fell apart, and European talks changed to outright treaty changes, suddenly euros became short in supply right along with dollars. It was all tricks and accounting shenanigans; distilled into their basic essence that was all that was really offered, to play upon emotion as if emotion were the whole central pivot. The benefit of hindsight reveals the true motivation, however. Central bankers and government authorities really had no idea what to do because the destructive capacity of the eurodollar was taking place beyond their gaze. They were confronted with a problem far beyond their self-limited grasp, forcing them to work more so off past reputation (misplaced) than actual effectiveness. Some of that is clearly behind this seasonality. Eurodollars are probably the most misunderstood aspect of modern finance and banking. They are not really dollars, and are not really tethered to Europe by anything other than happenstance. The eurodollar market is simply the Wild West of the banking system, a regulatory black hole where regulation is sparse and lax. London is its capital because “the city” and British regulators have placed little to no restrictions on banks doing foreign lending. So the eurodollar market is, again both figuratively and literally, an accounting creation (Milton Friedman published a great paper in 1969 about how eurodollars work, and why they are nothing more than figments of imaginative balance sheets). “Imaginative balance sheets” became more the operative pathology as the more prominent parts of the wholesale paradigm shrank into irrelevancy. As money dealers withdrew from unsecured lending in 2011, nobody ever went back despite renewed faith in monetary policy by 2012. The federal funds market is in 2016 basically the pocket change of GSE’s, and little else. From that point on ultra-short was repo, but more so depending on other balance sheet characteristics like dark leverage. But that, too, began to decline as a direct consequence of the events 2011. 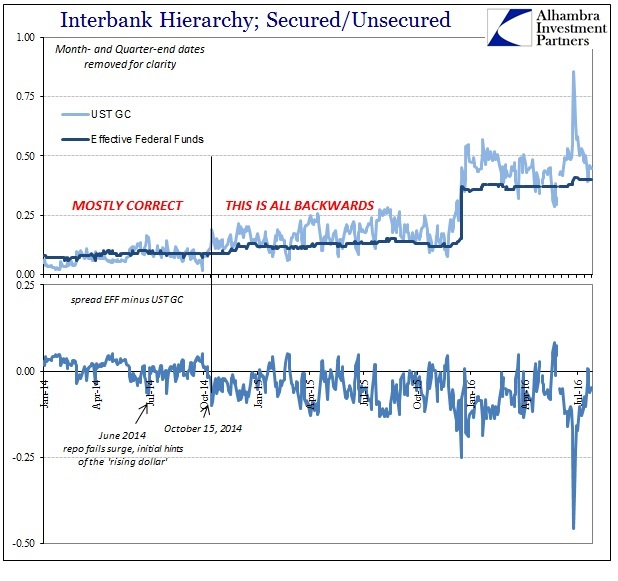 As noted yesterday, if the first disruption in the eurodollar starting in August 2007 was at the “front door” of federal funds and commercial paper (and repo due to collateral shortages), the inflection in 2011 was at the “back door” of derivatives like IR swaps and cross currency basis swaps. What was more explicit about the eurodollar decline in 2011 has in the years since become far more implicit. 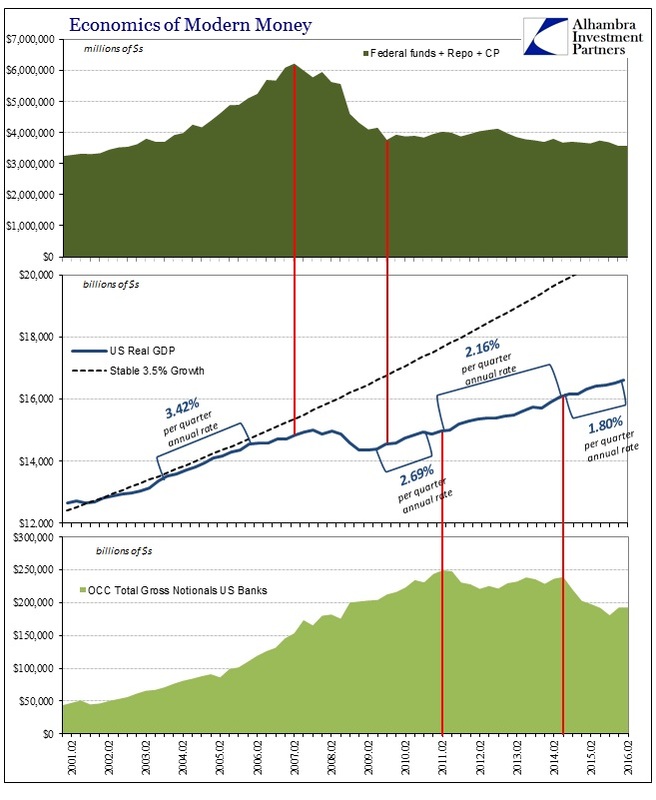 That allowed monetary policy to play upon a sort of visibility imbalance, where QE and central bank expansion was open and evident while the much larger monetary decay of the eurodollar was (almost) entirely concealed by its own evolving nature. I think that is what causes so much confusion as to what is taking place especially under this “rising dollar” moniker. There are no major announcements of money market funds withdrawing from Europe, no central bank proposals to fill up what is becoming dangerously dry. Part of that stems from the same mistakes about monetary policy, including misinterpretation of policy by policymakers themselves, but I also believe that this more “underground” eurodollar is a big part of it; maybe even the majority. The slope is shallower, clearly, than either 2011 or especially 2008, but all the same characteristics are exhibited. It is textbook deflation, only more gentle (though still not all kind). And we find the same strong seasonality in the economy and also and particularly WTI and oil prices. Where the straight-forward federal funds market used to represent the front entrance into the wholesale realm, now the repo market, where only the small tip of the funding iceberg sticks out in measurable possibility, is. Central bankers still talk about how they fixed everything, though in 2016 there is a faint but detectible quiver when they do so, yet even from the depths of obscurity we can observe the consequences of that not being close to true. It’s summer once again and oil prices are dropping as repo signals anything but global accommodation.